Add some fun to your wall decor with the addition of this friendly dog head. Soft and cuddly pug head that will add some quirky style to you living room or hallway wall. Wall mounted animal head with a funky difference. This pug head is soft and stuffed full of fluff, super cute and friendly looking that will appeal to children and adults. Complete with dog collar around his neck, this pug is a great addition to our wonderful range of wall mounted animal heads. From fun and funky to traditional and exotic. Add some fun to your wall decor with the addition of this friendly dog head. 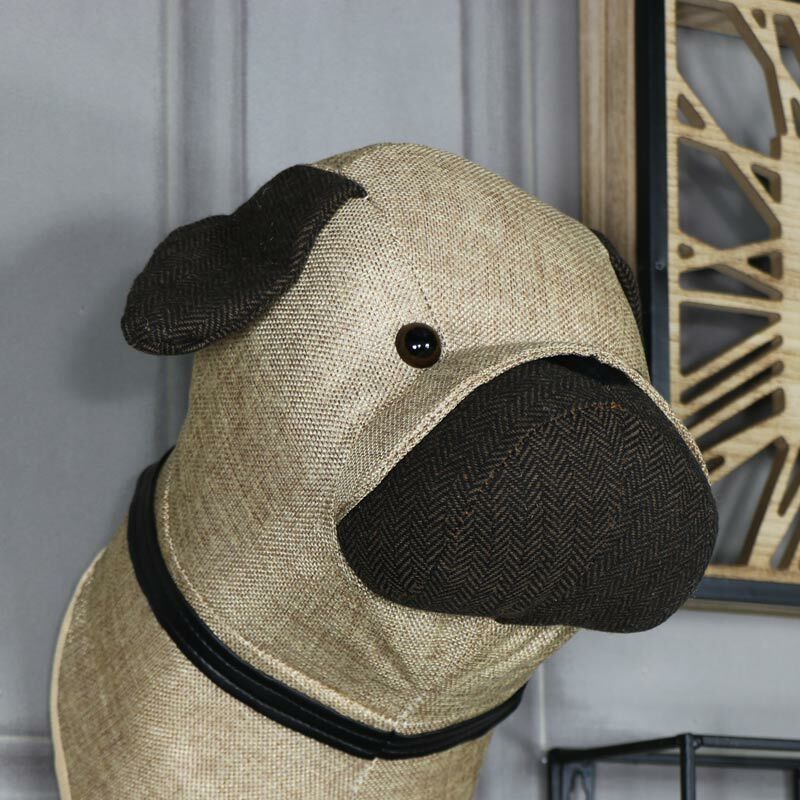 Soft and cuddly pug head that will add some quirky style to you living room or hallway wall. Wall mounted animal head with a funky difference. This pug head is soft and stuffed full of fluff, super cute and friendly looking that will appeal to children and adults. 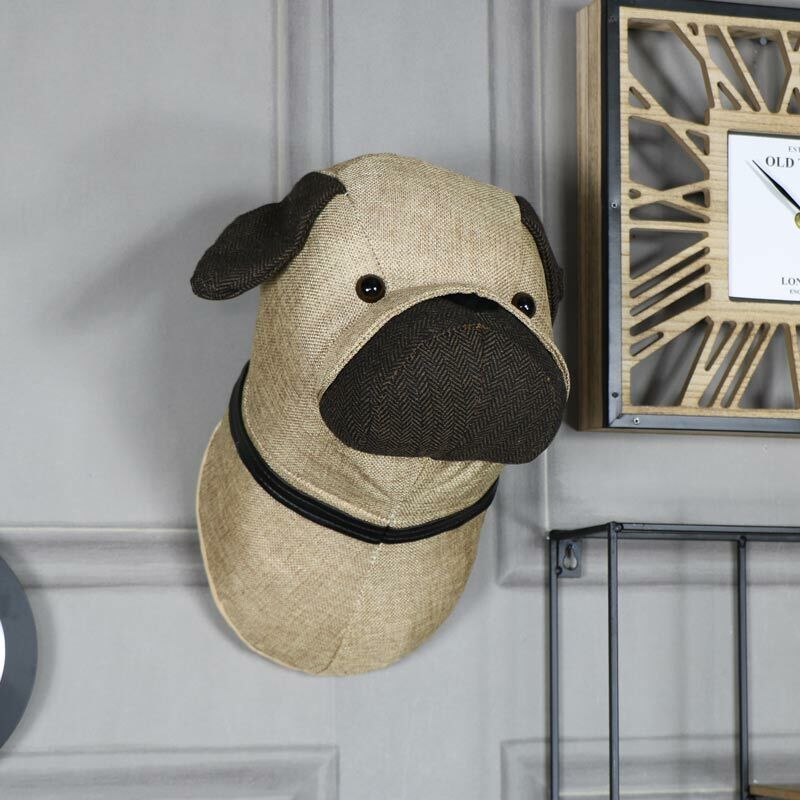 Complete with dog collar around his neck, this pug is a great addition to our wonderful range of wall mounted animal heads. From fun and funky to traditional and exotic. In a soft brown colour, this guy is made from polyester and stuffed with cuddly fluff to make him super soft. Easily wall mounted with a cotton hook on the back. We have an extensive range of wall mounted animal heads that will liven up your decor and add that extra 'wow' factor to your home. From the usual rustic country stag heads to the more fun and industrial style, this pug head is a fantastic addition.